“If I eat another thing, I’m going to explode like a cartoon or maybe pass out,” I thought to myself. I had eaten a lot that day…food truck food, other restaurant food, and I had plans to eat dessert elsewhere. I had indeed made a fatal flaw in the food blogging world – I went into a meal low on hunger because I had eaten too much earlier. I had mistaken my proverbial bottomless pit for an actual bottomless pit. I don’t make that mistake much, but I did at The Treehouse and I was a disappointment to myself. Nonetheless, I was able to get a thorough look and taste of the restaurant before falling into the trap of the full belly. The Treehouse on Stevens Ave. was previously known as The Cafe until early in the current year. While I’m told the menu hasn’t changed much, I had never been to the location under any name, so it was all new to me. We climbed up the stairs to get to the second floor restaurant above Pat’s Meat Market where we met some friends who were there with drinks already. Mrs. Portlandeater and I quickly grabbed drink menus and chose some libations. I felt that the Starboard Cosmo with Absolut Citron, peach puree, white cranberry juice, and fresh lime would suit me just fine. Sure it had a feminine name, but I had no shame; it had ingredients I loved. My wife chose the slightly more masculine Sirens Sangria – house-made sangria, red wine, Cointreau, brandy, seasonal fruit, rosemary. In between catching up with our comrades, we discussed some food options. I ruled out the salad and flatbread sections of the menu. I was feeling a potential appetizer and definitely an entree. At some point, the waitress delivered our drinks and went over the specials of the night. There were quite a few and a couple of them sounded pretty strong. I took a sip of my girly drink to help contemplate my options. It was delicious. How could it not have been? It was a combination of great ingredients. Fruity? Check. Garnished with a single cranberry? Check. Delicious? Check. I was told the sangria was good too and the sprig of rosemary gave our side of the table a bit of an herbalicious odor. While sipping my Cosmo with a pinkie in the air, the waitress came to get our orders. I had decided on a special North Atlantic Scallops in a dish of phyllo dough with mushrooms, caramelized onions, gruyere cheese, and a side of Romano mashed potatoes. That sounded outstanding. My wife went with the Baked Stuffed Haddock special with crumbs, crab, and also the side of romano mash. Another order of the haddock and a grilled tenderloin rounded out the orders and we decided to throw in an appetizer to share at the last minute. We chose the Ravioli Crisps – sauteed shallot, garlic and walnut tossed with spinach, creme fraiche and lemon. During the intermission between placing our orders and actually receiving food, we had time to chat and soak in the atmosphere. The restaurant, though dark, is really warm and beautiful. There are wooden beams throughout and decorative greenery and lighting adorn them giving the restaurant the appropriate treehouse feel. The separate lounge area has a very inviting bar and seating area. The darkness definitely works well with the atmosphere and the restaurant would be very good for a romantic dinner for two. We weren’t doing that, but it was still very nice. The ravioli came out in all it’s crispy glory. I could smell the heavy garlic from across the table. It had to be good. I took one and shared with Mrs. Portlandeater. Yum! I loved that it was crispy with lots of delicious garlic flavor. The spinach was just tossed in and therefore not really cooked which was perfect, and the sauce was delicious. This was a winner. I savored every bite of the crispy garlic pasta pillows and noted that this would probably be best in multiple orders. There were three on the plate but I wanted to eat more, more, more! Unfortunately, I was about to realize that would not have been possible. Post-ravioli, we got a basket of bread. I was just starting to realize my fullness by that point and avoided it. A few minutes later, our meals came out. It was dark, so they were difficult to see, but my scallops were “open faced” with the dough pinched around them. I was told there would be about three, but it seemed more like five of the delicious ocean dwellers. I was ready to go at them with full force. I grabbed my fork and knife and went to work. Cutting a piece of scallop and dough and trying to get plenty of cheese , mushroom, and onion, I shoveled a piece into my mouth. It was really, really good. The flavors were absolutely perfect together. The crispy dough worked as a brilliant housing and the bite included tons of cheesy flavor without overpowering the scallop. Magnificent! After a bite or two of the main course, I tried the romano mashed. I like pretty much anything potato, but these were extra-good – slightly cheesy, slightly buttery, and with fluffy mashed texture. My meal also came with a grilled zucchini which was excellent. I worked on my food as though it was my job and about half way through I started to fade. I ate one scallop and then another until they were done, finished about half of the rest of my meal, and then all that food I had eaten earlier in the day came back to haunt me. I submitted. It was just too much. I realized I had made a terrible miscalculation and that I would not be able to finish what was turning out to be an utterly delicious meal. I had failed myself. Despite my mistake, I can definitively say that The Treehouse makes some great food. The drinks were very good, the baked haddock seemed to be loved, and my meal was outstanding. The grilled tenderloin got a moderate response, but it’s accompanying acts were lauded as top notch. Overall, this place hit the bullseye. The cost for Mrs. Portlandeater and I came to about $87 after tip which I would have been really happy with had I been able to finish it all. This is unquestionably a place you should add to your list. It’s in an area we don’t get to much, but it’s worth making the visit. Just don’t eat first! 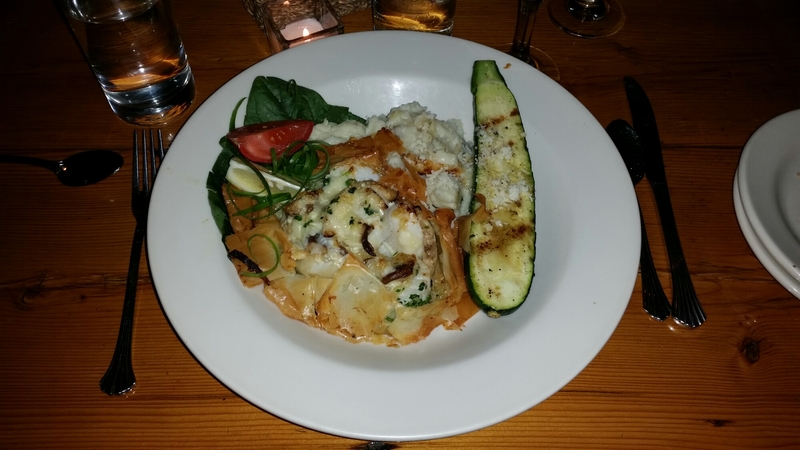 This entry was posted in Portland, ME food on October 10, 2015 by peterpeterportlandeater.